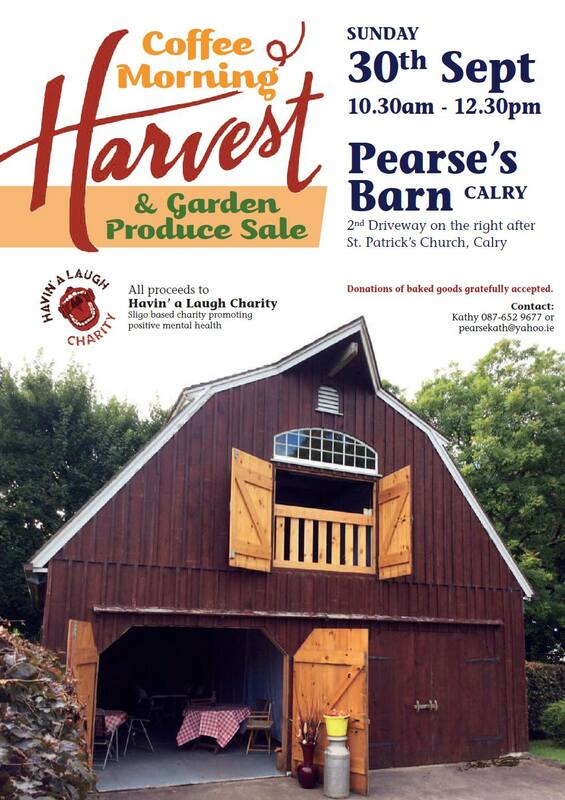 Our Coffee Morning, Harvest & Garden Produce Sale held in Pearse’s Barn, Calry was an outstanding success generating over €1700 in donations. The coffee morning, held on Sunday, 30th September last, was organised and hosted by Kathy Pearse and Jill Womack. They wanted to show support for Havin’ A Laugh as well as informing more people about the charity by running this event. You can find out more about the service we offer here. Pearse’s Barn was built by Kathy’s late husband, he used authentic New England pine, and as you can see from the photo it’s an excellent piece of craftsmanship. In fact, one person traveled all the way from Manorhamilton to the coffee morning in Calry to have a look at the barn, and no doubt they left suitably impressed. There was plenty of delicious fare on offer during the coffee morning, and in addition to yummy cakes and coffee, there were also healthy vegetable baskets and fruit compotes fresh from the farm to be had. Many thanks to everyone who donated items to the event and who and came out in big numbers to support it, with some stopping by to socialise after morning mass. Eilis Needham gave generously of her time and entertained the crowd by giving a great performance on the harp. Finally, we would like to also take this opportunity to thank the regular attendees and donators that come to our awareness and fundraising events.